Hello again! Yes, I know it’s been awhile but with this letter there are so many interesting way of doing it I went through 15 different sheets before I decided on the one I wanted to post! 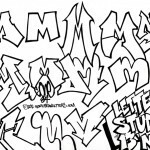 Introducing the letter M in graffiti style! Yet another one of those sickeningly important letters to learn because it is part of so many words! The variations that can be achieved with this semi-complex structured letter are endless because there is so much to work with so practice and experimentation are essential to make this one of your own. Keep in mind that simplicity is always key when starting a new letter and that this one can easily go from the coolest letter you’ve ever expressed to a menacing blob of ugly in a few strokes of the pencil. It’s very easy to overwork but looks golden when done with the expertize of someone who’s put in the practice to get it right. I do each of these studies using 4 simple tools that almost anyone has access to. It’s as simple as 1 sheet of paper, a pencil, an eraser and a black flair pen(rollerballs and microns work wonders as well, but I prefer flair). No special tools, no special paper. Just the simplest, most common devices mixed with a little time and effort will get you astonishing results. I remind you of this in order to encourage and to let you know that ANYONE can do this with focus and effort. It won’t happen right away. It’s hardly the ONLY example you should be taking. But it’s attainable. 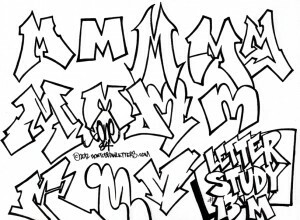 Almost all wildstyles are a simple progression from these simplest styles of lettering but without the fundamentals it’s easy to get “lost at sea” and end up producing something you won’t be proud of later. I strongly encourage anyone that is following this page or learning to draw anything at all to keep your work from now and never throw it away. Put it aside somewhere so that you can dig it up later and see the progress you are making. I still keep my blackbooks from the 80’s and can tell you that every time I open them up I find something I did in the past that will inspire something new to do in the present. Sorry again for the delay between posts, the next one will come much sooner!